Funeral services for Mildred Hazel Ferrell Hughes age 97 of Shelbyville will be held at 1:00pm Wednesday, December 19, 2018 in the chapel of Doak-Howell Funeral Home with Brother Don Frensley officiating, with burial to follow in Evergreen Cemetery in Murfreesboro. Ms. Hughes passed from this life Saturday December 15, 2018 with her family and friends at her bedside. Visitation will be held Wednesday from 10:00am until service time at 1:00pm. Born August 7, 1921 in the Short Mountain Community of Cannon County Tennessee, she was the daughter of the late Ed Ferrell & Dovie Ann Melton Ferrell and was preceded in death by her husband Jesse Taft Hughes, brother Florist Ferrell, sister Mazel Ferrell and son-law, Phillip Pyrdum. Ms. Hughes, besides being a mother, grandmother and great-grandmother, worked a short time at Pencil Printing, and most of her life as a seamstress, and worked for several years at Model Laundry. She enjoyed quilting, her flowers talking to her chickens and mowing the grass. 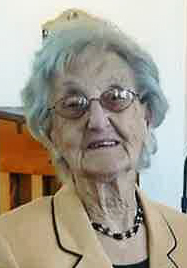 She was a long time member of the Fosterville Baptist Church. Survivors include her children; Ray Samuel (Joann) Hughes of Murfreesboro, Darlene Pyrdum of Shelbyville & Jesse (Sandra) Hughes of Shelbyville & brother Tony Ferrell of Lebanon. She had 8 grandchildren, 15 great-grandchildren & 9 great great grandchildren. Memorials may be made to Fosterville Baptist Church in her memory.